The 1960s Mercedes sl is a true icon of design with muscle car looks it is no wonder that these cars have never gone out of fashion. This particular example was imported from the states and although it was sources from the dry states the general condition suggests that it had spent most of its life in far wetter climates. The Mercedes was delivered to our bodyshop s already stripped by the client and he had also commissioned previous body work to be carried out. It had new rear wings, floor pans and sills welded in, unfortunately they had not been welded in correctly as we would later find out. 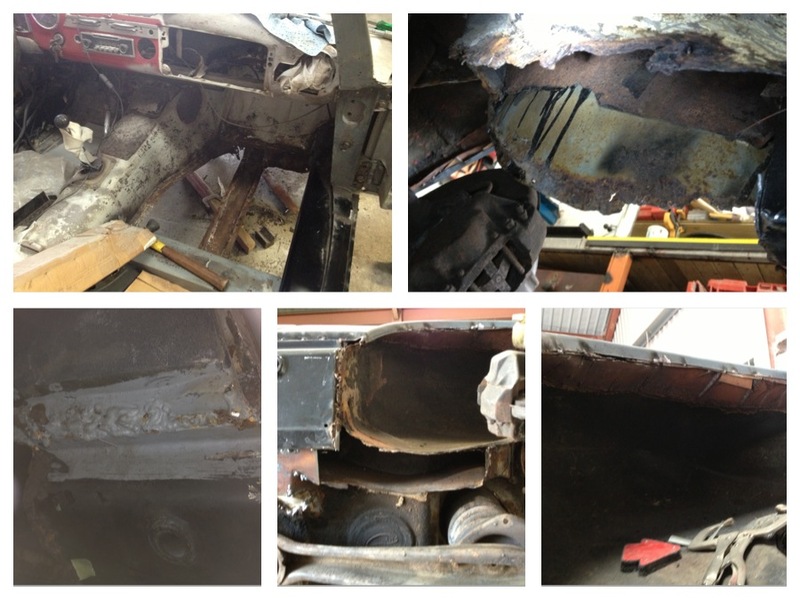 As with any major restoration the first job was to complete the welding and panel fabrication but there where some suspicious areas of fibreglass matting that had been found around the rear irs suspension mounting points. We burned these off and found that the rear suspension was not connected to the car making it extremely unsafe to work on yet alone to drive. New metal was shaped up to repair this area of floor as a priority. 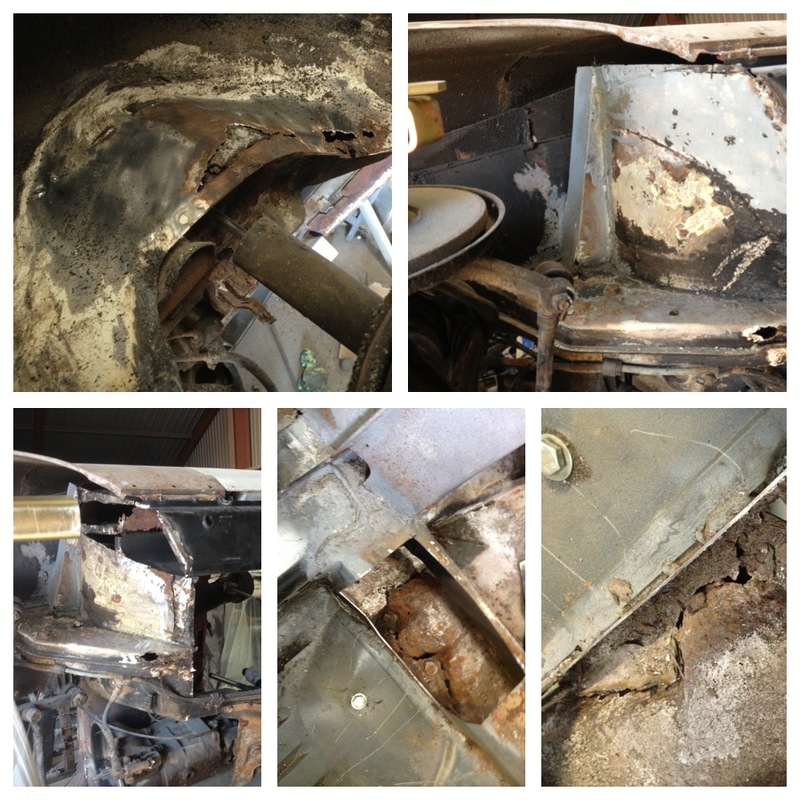 from top left: floor pan and support leg, rear chassis member, example of heavy welding (all needed grinding off), rear chassis leg and floor / suspension support, poorly fabricated inner wheel arch. from top left: rear inner wheel tub, front inner wheel arch missing and holes in chassis beam, holes in floor where suspension mounts both sides. Once the suspension support panels where replaced the Mercedes could be transferred to our car roller and rolled over for under body welding to commence. 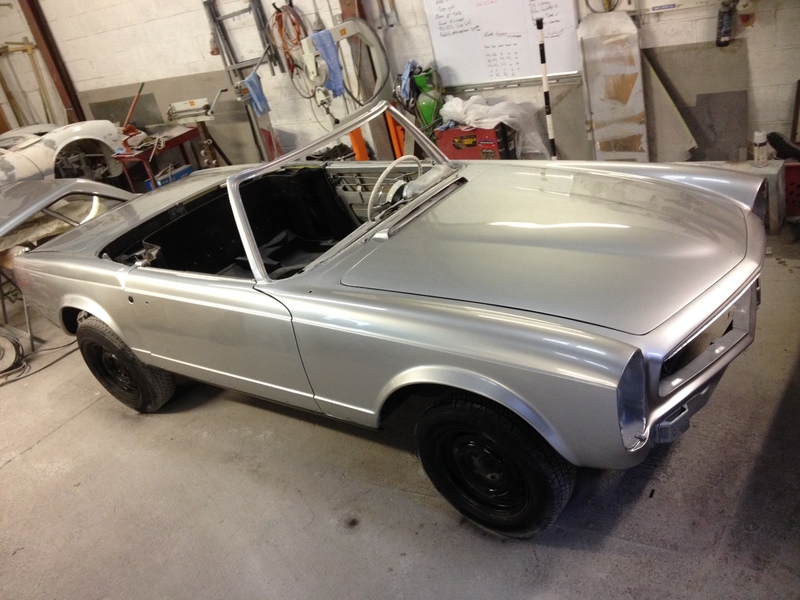 Welding and fabrication was varied and included rear wheel arch tubs, rear panel corners, engine bay front grille, lower front wings, chassis legs, front inner arches as well as repositioning the new floor pans. 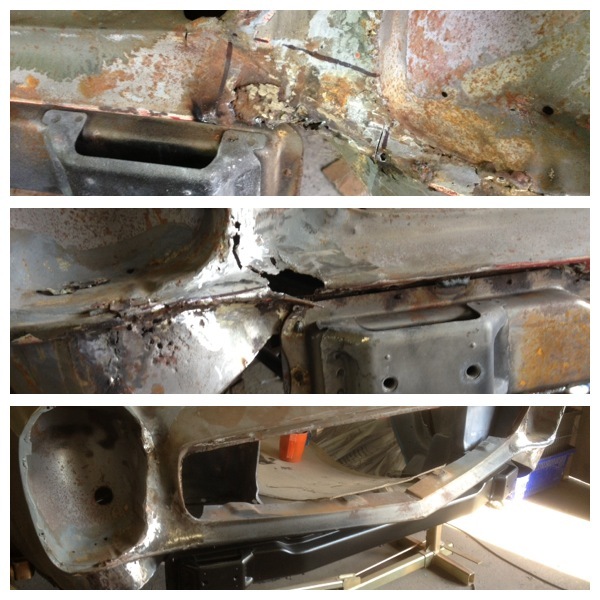 We also had the task of cleaning up some of the worst welding we have ever come across. The restoration of the Mercedes was now being heavily delayed due to correcting the work that had previously been carried out. Holes around the front panel; bottom section shows the shiny new metal areas fabricated to fit. 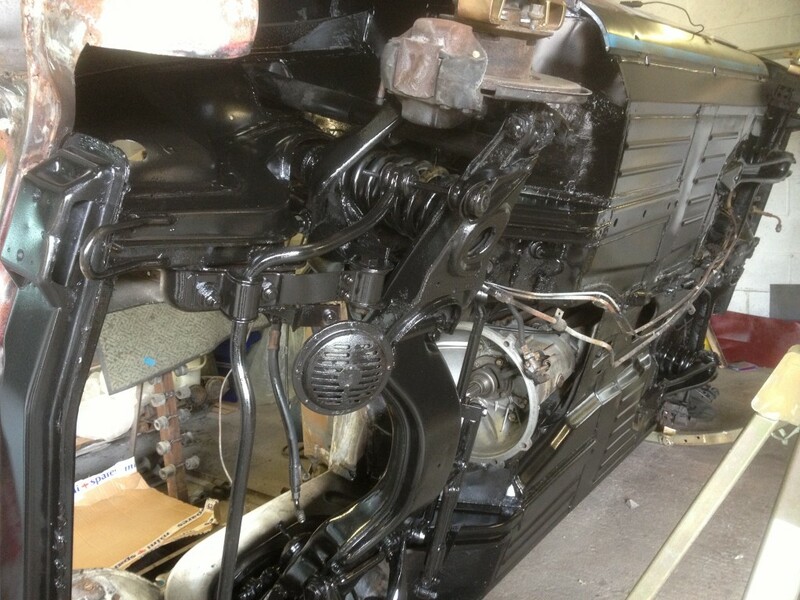 Once all the under side was welded we cleaned of the existing Mercedes underbody protection and coated the underside. 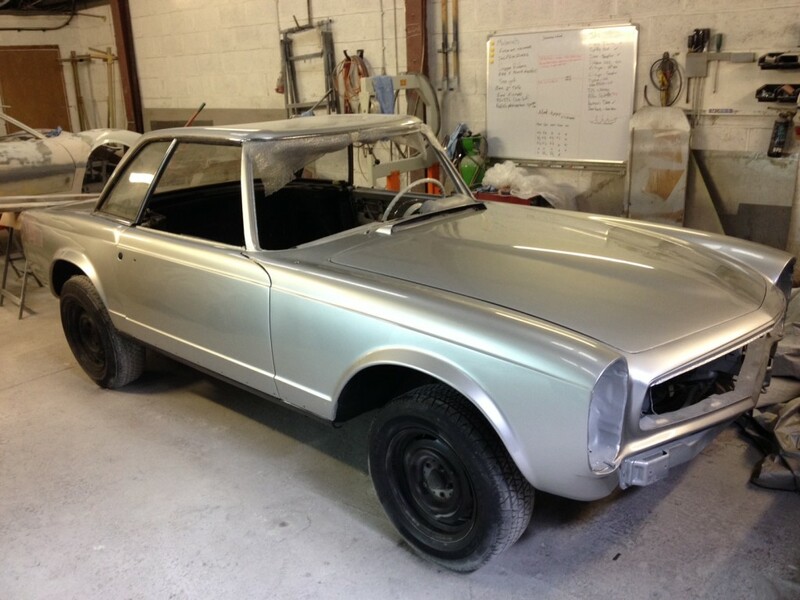 Using Rustbuster Epoxy Mastic Rust Proofing Chassis Paint (winner of practical classics 3 year test beating POR15). With the underside finished the Mercedes could be removed from the jig for upper body profiling to begin. The upper body required considerable work all over but my biggest concern was the heavy coating of filler that had been previously applied to the NEW rear wings. 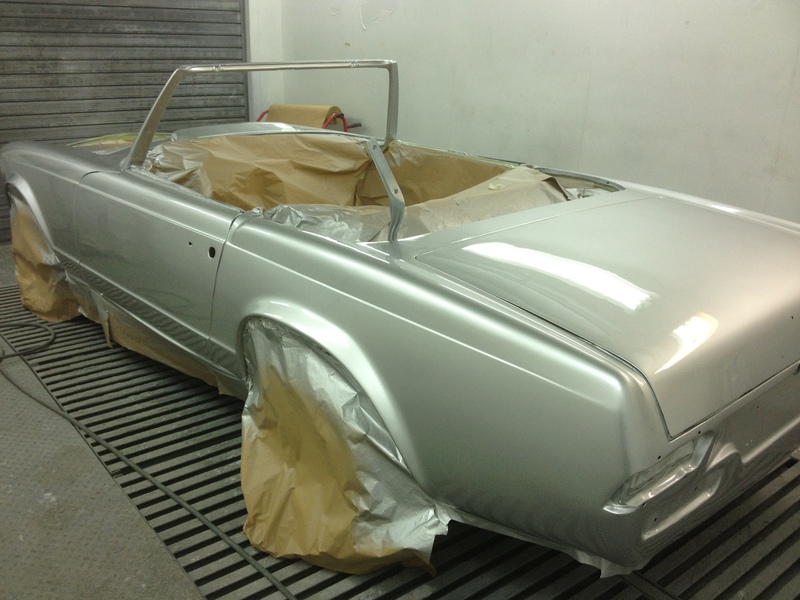 Once the filler was removed we found that it was covering a very large dent right in the swage line above the rear wheel arches and there was considerable panel distortion from the heavy handed welding. Even worse was what appeared to be something out of alignment one wing was sitting higher on the car then the other throwing the lines visually out this had to be dealt with. Lots of hammering, pin pulling and shrinking action managed to recover the rear wings to a suitable standard but some filler would have to be applied to assist the shaping. 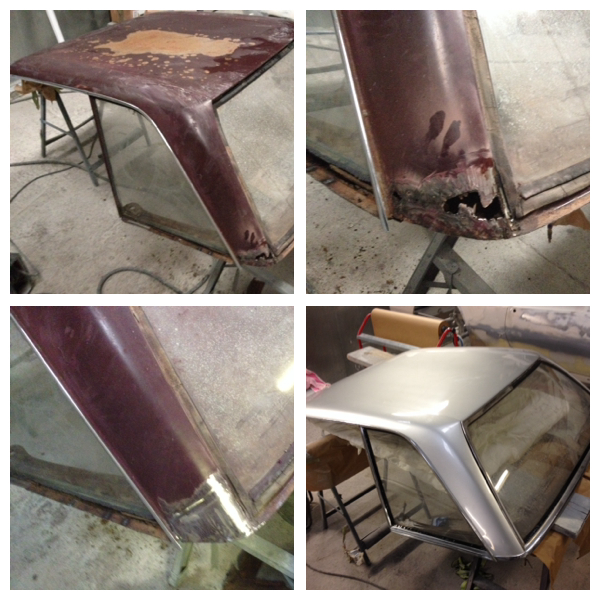 The next stage of the process was to reshape the bonnet to fit the engine bay, and remove dents and ripples from all the opening body panels (doors, boot lid and bonnet). It was finally time to check the body work so a preliminary coating of primer was applied and rubbed down so we could see what still needed attention. 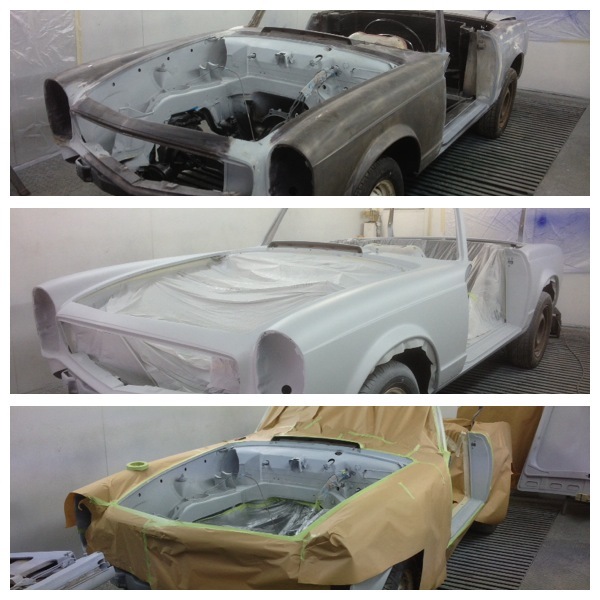 Once these areas where addressed the body received another coat of primer and was sanded for final detail profiling. 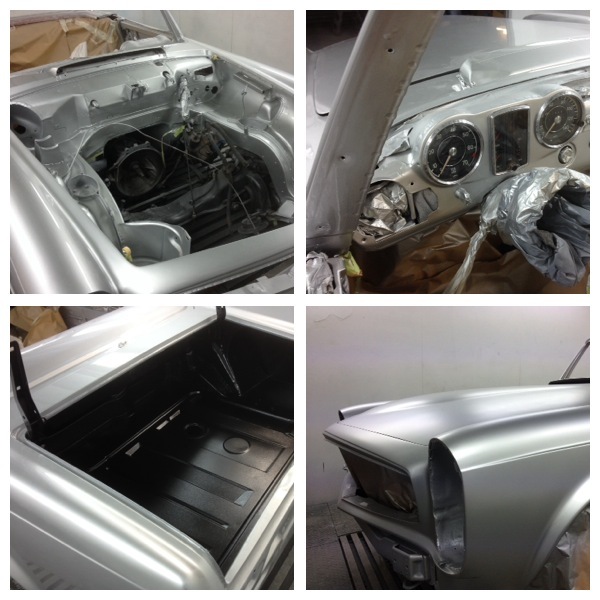 as the Mercedes was to be painted in Mercedes 744 brilliant silver we decided it would be best to paint the engine bay, door shuts dash and opening panel inside first. 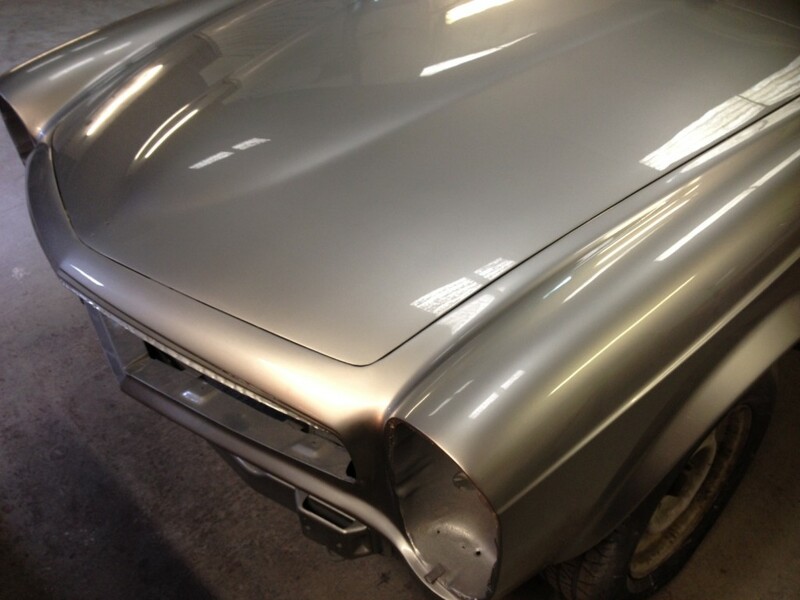 This way the opening panels could be mounted back on the Mercedes and the silver could be applied over the entire external body work in one application helping to ensure even coverage of the metallic coverage across all panels. 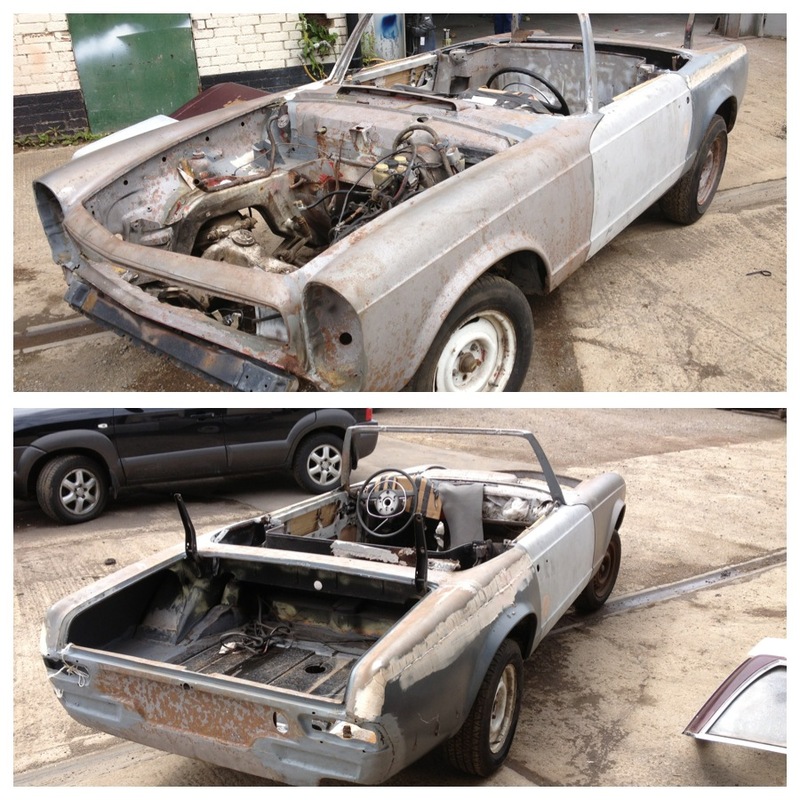 All that was now left was the removable hard top, a little bit of refitting and detailing. 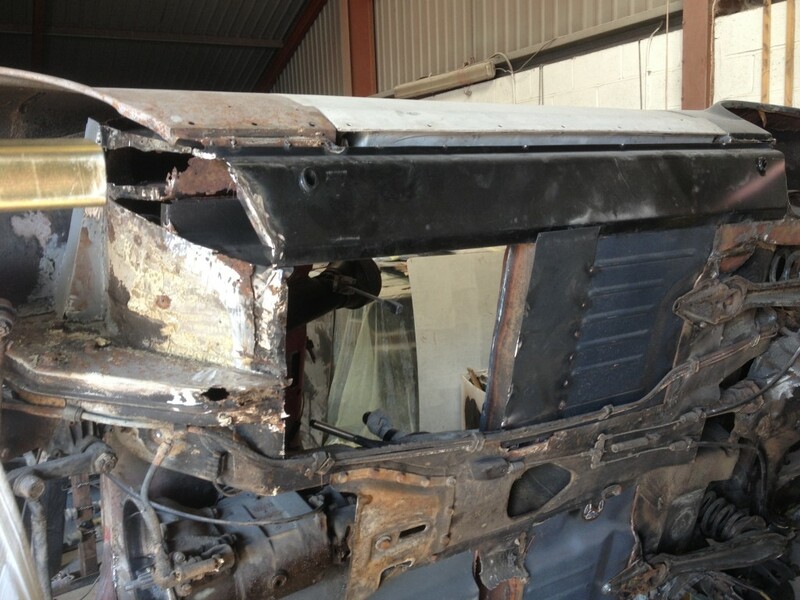 The hardtop Had new metal sections made for the rear pillars and underside where trapped water had eaten the metal away. 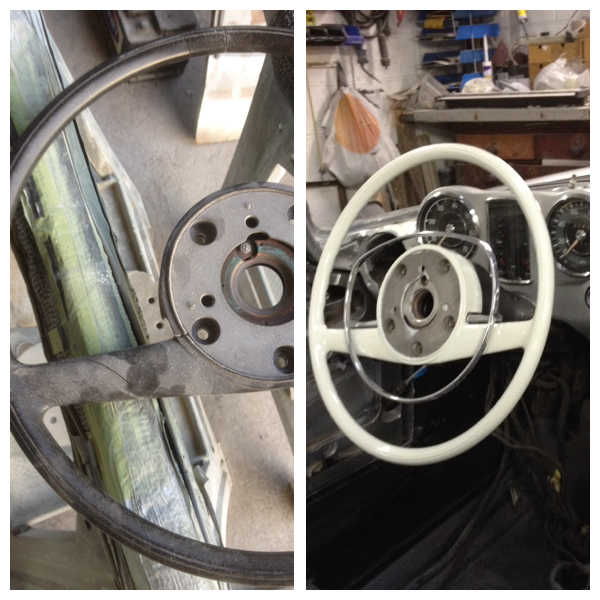 Another small detail that was repaired and painted was the steering wheel. The old wheel was exceptionally cracked and broken. The steering wheel was repaired using fibreglass resign reinforced with microfibres before being prepared and painted in classic cream. 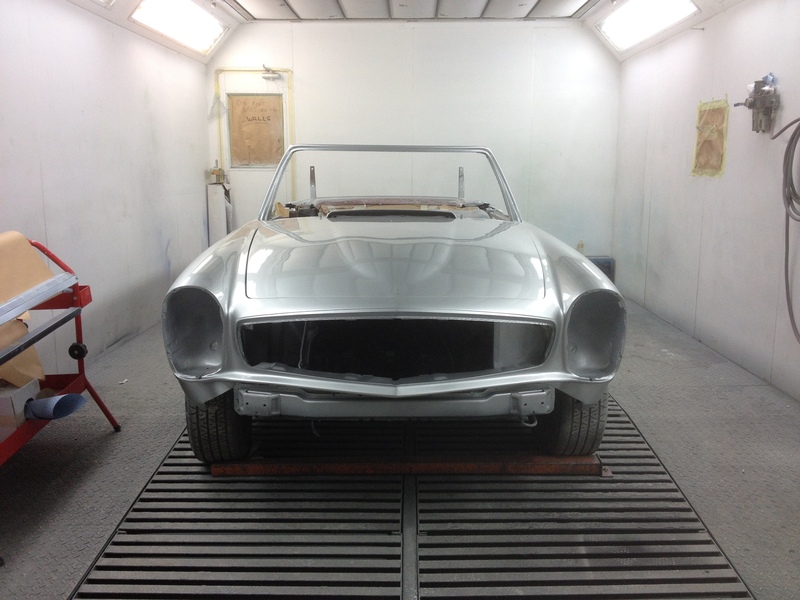 This entry was posted in Paint jobs and tagged 230sl, 250sl, 280sl, full respray, mercedes, restoration by The Paint Shop Pros. Bookmark the permalink.